Wilbur’s of Maine just became part of a growing number of businesses reducing energy costs with solar power. 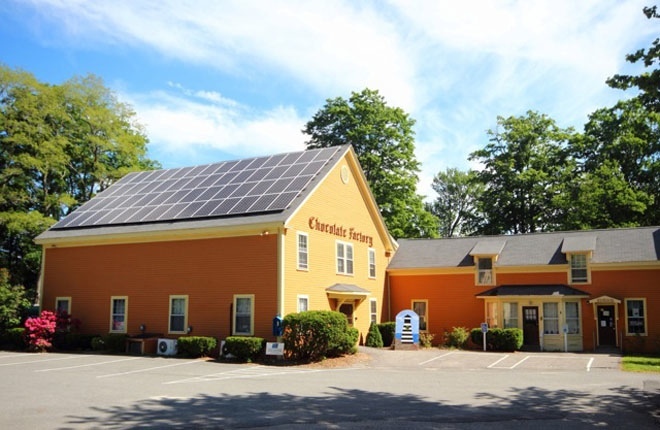 Maine Solar Solutions installed panels on the south- facing roof of Wilbur’s chocolate factory at 174 Lower Main Street in Freeport, plus an electric vehicle (EV) charger, now available free to Wilbur’s customers. ?Q: WHY DID YOU DECIDE TO INSTALL SOLAR PANELS? A: If more businesses produced their own electricity, perhaps we could eliminate some electrical power stations. In order to finance power grid upgrades caused by small business users, a demand charge, based on the highest 15-minute period of every month, was amounting to 30 to 35 percent of our monthly electric bill. So far, the solar panels have decreased those charges by $178 per month. Q. HOW MUCH DID THE SYSTEM COST? A: The 56-panel array was $48,000. However, we’re eligible for a 30 percent tax credit, and we applied for a 25 percent USDA grant. If all comes through, that’s more than half the total cost. The breakeven point should occur in the fourth to seventh year depending upon the final cost, and panels are expected to last 40 years. Q: HOW MUCH ENERGY DO YOU EXPECT TO GENERATE? A: The array has the capacity to produce 15,000 watts at peak capacity. It produced 2,297 kilowatt-hours in the month of May, which amounts to about 18 percent of our normal usage. We expect it will reach a total of 20 megawatts this year. Q: WHAT ABOUT THE EV CHARGING STATION? A: Maine Solar Solutions offered the electric-car charging station as a free benefit, so in turn, we are offering it as a free benefit to our customers. A: Another roof of about 36 panels.